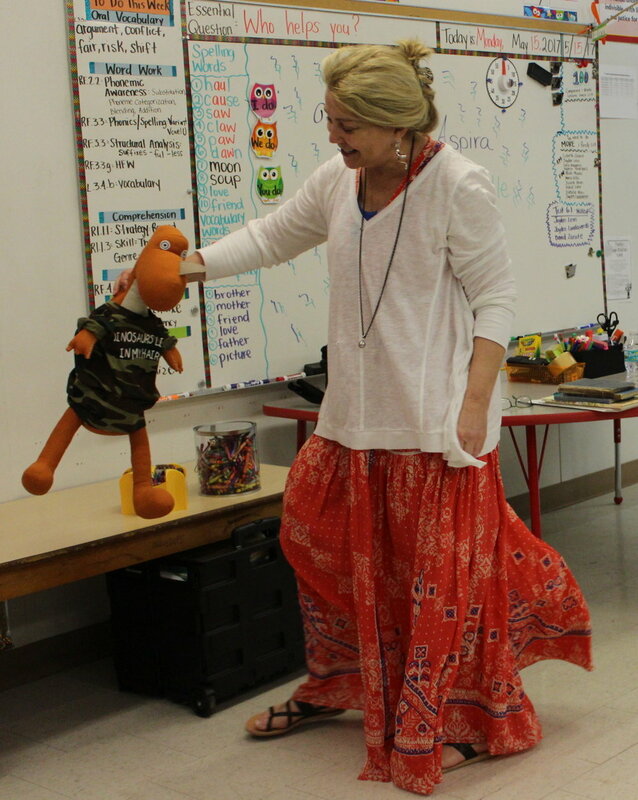 I visit elementary classrooms across the country and share my love of poetry and stress the importance of reading. School settings are varied in our country. The urban city schools where children begin at 7:15 a.m. and don’t return home until 6 p.m. are a stark contrast to private institutions where the child/teacher ratio is 13:1. Whether it's a Michigan one-room schoolhouse, rural, parochial, public, urban, charter or a school housed in a refurbished shopping center, the students are essentially the same. There is a universal language they respond to. Some students are fortunate to have an attention span which allows them to sit still. Others do not. Some are verbal learners while some more visual. They want to know they are special. They want someone to take the time to give them a hug and share with them. They love to ask questions. They love to talk about themselves. They are honest. They are magic. Dinosaurs Living in My Hair 2 gives me an opportunity to discuss how we share many things in common with each other. This is an opportunity to focus on what unites us, not what divides us. DLIMH2 takes Sabrina into a first-grade setting where she and her four friends all have curly hair. Commonality. Sabrina still thinks she is the only one with dinosaurs living in her hair. How many times do we think we have a problem or issue which is unique to us, only to find out, others experience the same thing? Sabrina unexpectedly learns her friends have dinosaurs living in their hair and it is an aha moment. Her world view suddenly expands. The fact the dinosaurs help the five curly-headed first-graders combat difficult students who bully is a bonus. The simple everyday advice of stand tall, keep our shoulders erect, make eye-contact, throw mean words into the trash, and/or tell adults at school, provide these five friends with new tools to use. They become a united front. There will always be those who torment others. Perhaps simply making eye contact won’t eradicate bad behavior, but it begins the discussion. Any child I’ve met can immediately tell you “Imagination” is my favorite word. I believe children learn the act of creativity, the art of imagination, and the power of spontaneity when they witness this first hand. I am not afraid to be that crazy funny lady who comes to their school and gives them encouragement to color outside the lines. I believe they will remember the funny zany rhymes I read from my mother’s old dilapidated poem book, that lyrics to a song is poetry, and the beat of their own heart has rhythm. Dinosaurs are the hook to get their attention – but it is enthusiasm that keeps it. My intention is to plant tiny seeds which grow with time. My variety mix includes: the importance of reading, the significance of imagination, the fun in poetry, and the possibilities in creativity. One child at a time I believe I make a difference. Join the DLIMH Movement and widen the circle of hope. Lauren Danielle who initiated my journey and gives me strength. I am a wife and proud mother of three children. Our two sons bookmark a very rambunctious and active daughter. Lauren’s unconventional zany curls are a reflection of her untamable personality. Even today she is allergic to combs and brushes. The twists and kinks have a mind of their own. When Lauren was a child, parts of her hair never saw daylight. I would say, “There could be dinosaurs living in there and we would never know.” This comment did not encourage her to groom more often, but instead sent a twisted smile my direction. She would vanish out-of-sight before I blinked. It was a constant battle I seldom won. Sabrina was born out of Lauren’s strong and determined attitude and her mass of uncontrollable curls. In January 2013, Lauren encouraged me to publish Dinosaurs Living in My Hair, a poem I wrote for her as a child. When it was clear she wasn't going to take "No" for an answer, my journey began. I had a vision and a gravel road in front of me missing all directional signs. My instincts said, find an illustrator. 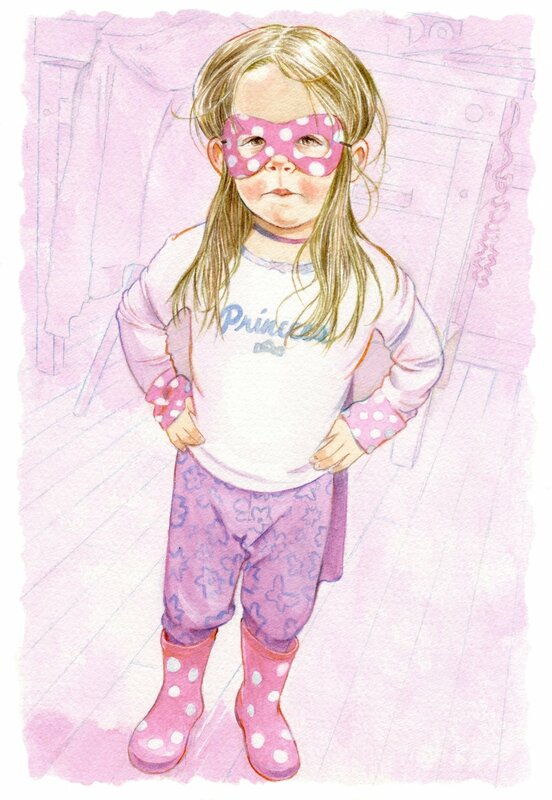 I came across a watercolor painted by Anni Matsick called "Pink Princess." It immediately spoke to my heart. I stared at it for a long time, wrote down her information, and drafted an email. Anni Matsick did become the illustrator for Dinosaurs Living in My Hair. Her watercolors bring an emotional expression to her characters and bring words to life. With her twenty years+ of experience she catapulted this project to the next level. The second addition to the Dinosaurs Living in My Hair team was Chris Schechner who Anni recommended for book layout and creative art design. His expertise and forty years+ experience enriched the “team” again. The three of us began in spring of 2013. The last group to round out this “team of experts” tuned out to be our three grown children. Each has profoundly helped in this creative endeavor. They have added their knowledge and skills, by building websites, teaching me how to Facebook, proofreading, creating logos, designing, editing, listening, and encouraging me along the way. They are my inspiration. I grew up on a farm which taught me hard work and a little bit of dirt builds character. My mother’s gift of rhyme and humor set the stage for my love of poetry. An example was at breakfast, she often recited poems she memorized as a child. There were several, but our favorite was called, “School Days.” We would chime in when she got to the verse and say, “We don’t have to go to school to day do we Ma? Aw Shoot Ma.” My brother and I would laugh, head out the screen door to catch the school bus, and yell back, “We don’t have to go to school today do we MA? Aw Shoot Ma”. We would hear her laughter from inside the kitchen. I am grateful she is a part of my every day journey. 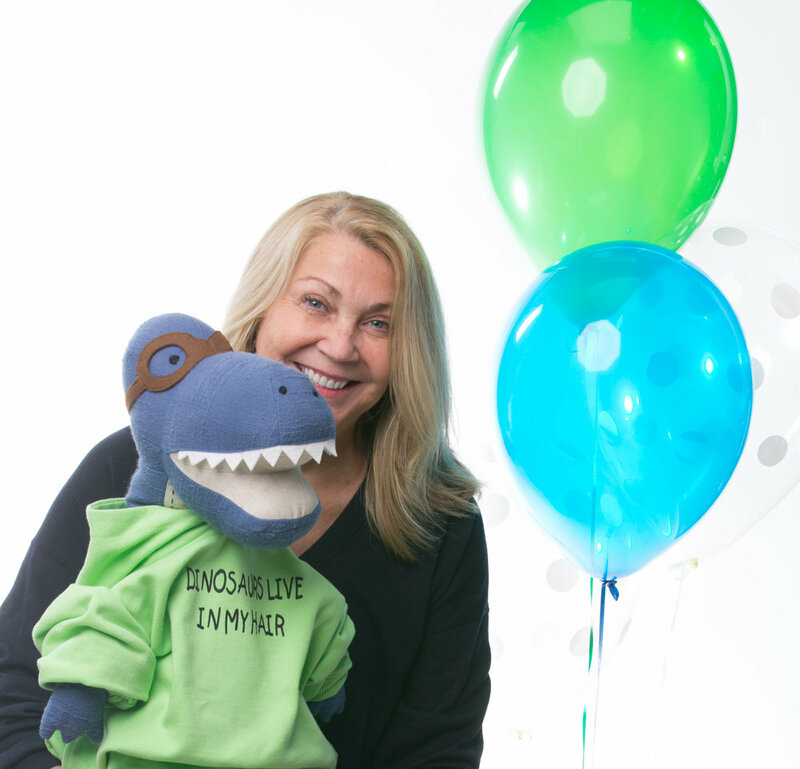 In 2014, I founded ROSEVALLEE CREATIONS which published Dinosaurs Living in My Hair, a children's picture book. DLIMH has received several national awards including the Mom’s Choice Gold Award (for Children's Picture Book), two Florida Authors and Publishers Presidential Awards, (Gold) for poetry and (Silver) for cover design, a Purple Dragonfly award First Place for poetry and several others. DLIMH2 is slated to be published September 2017. I love to go barefoot, sit-cross legged on the floor, pick daisies, and bake chocolate chip cookies. Although born and raised in Michigan, I spend half of my life in the Florida Keys. For me a favorite day consists of backcountry fly-fishing, an afternoon of writing, and watching the sunset with my husband (and Earl). Once upon a time the famous physicist Albert Einstein was confronted by an overly concerned woman who sought advice on how to raise her small son to become a successful scientist. In particular, she wanted to know what kind of books she should read to him. “Fairy Tales,” Einstein responded without hesitation. “Fine, but what else should I read to him after that?” the mother asked. “More fairy tales,” Einstein stated. “Even more fairy tales,” replied the great scientist, and he waved his pipe like a wizard pronouncing a happy end to a long adventure. When I read this, I found a sense of validation. Fairy tales continue to be my favorite thing to read. There is magic that lives in the imagination. As I travel the country doing school readings, I try to impart the importance of creativity, poetry, and reading. However, I believe we have a lot to learn from children as well. They, after all, are the true masters.